This section contains the list and details of all Patients, as well as the Physicians and any other possible accessioners/submitters in your practice. 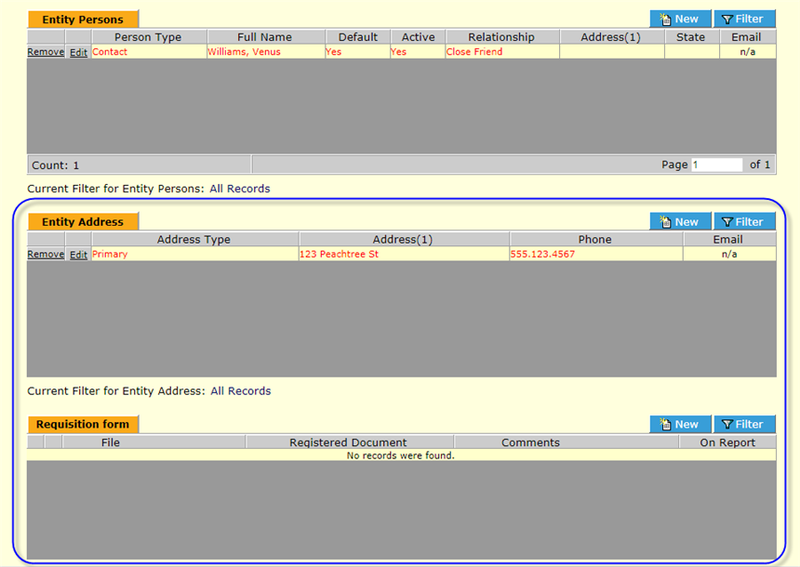 It can actually be a database of any entities you would like to have in the LIS (e.g. suppliers, etc.). Navigate to the Patient Management menu item. Click the New button. The New Entity Detail screen displays. Enter all information available (Bold fields are required at a minimum) and click Save . NOTE: A “Parent Entity” could be a primary facility or hospital, for instance, where the patient is receiving treatment. If the entity is other than a Patient, the insurance frames do not display. NOTE: Patient or other entity information could be automatically taken directly from your EMR/EHR if a HealthCloudPOL integration exists. Additional information may now be added in the same way, by clicking on the appropriate buttons to display their frames. The buttons toggle between Show and Hide. Add individuals related to the main Entity. …then click the New button on that frame. Click Select and Save . You can add ‘”child” or “sub-entities” to the main Entity by using the Child Entity frame. For instance, if a main entity is a facility, a child entity may be the main contact there, or a physician, etc. 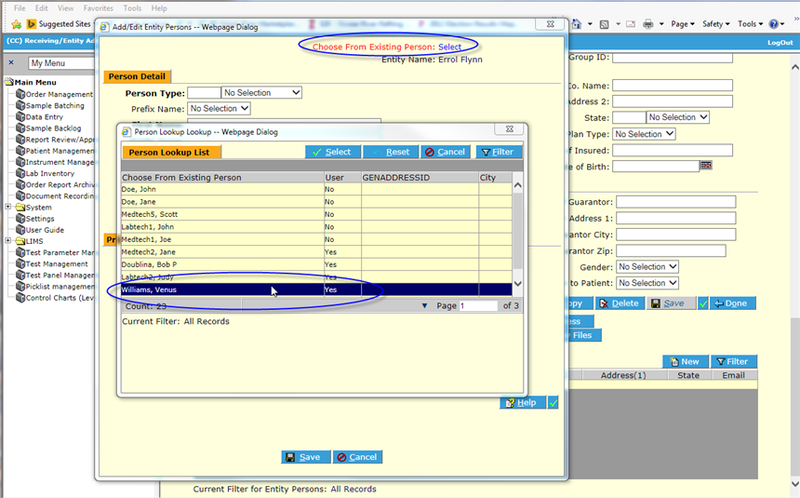 To add a Child Entity, click the Show Entity (Child) button near the bottom of the page to display the Entity (Child) frame. 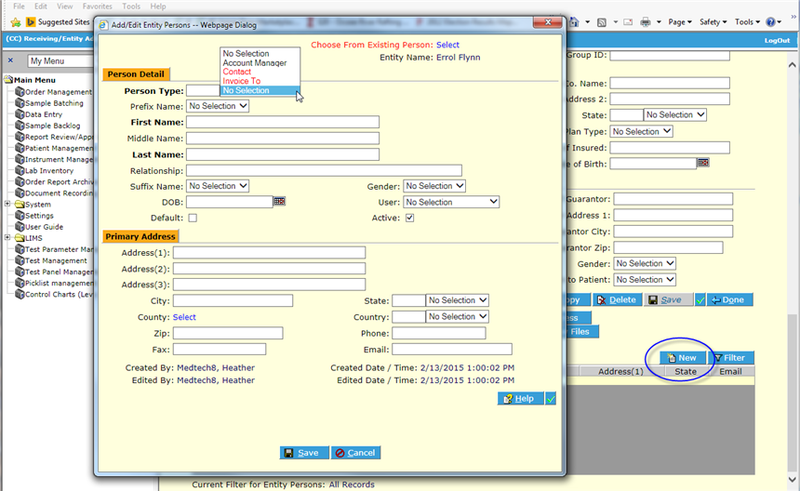 Click the New button and fill in the information about the child entity. The page that displays is the same form for adding any entity. You can add additional roles to the main Entity by selecting them here. Click the Show Types button near the bottom of the page to display the Entity Type Assignment frame. You can assign or unassign roles to this entity using the Add Selected button, Add All button to assign, or Remove Selected or Remove All buttons to unassign. You can also add additional addresses and/or upload files to associate with the main Entity using those frames. Click Show Address or Show Files to display those frames, then add information or upload files as desired. 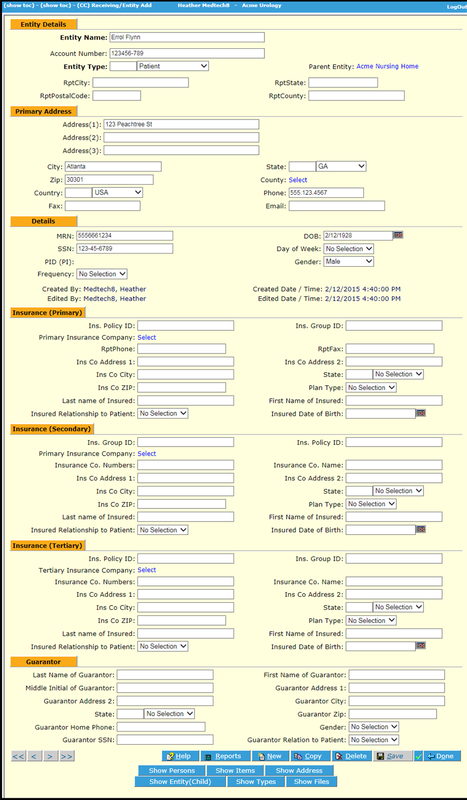 The Upload Files frame is usually labeled the same as in the Order screen, Requisition form. It may be used to upload any types of files.